All kids’ workshops are free. Parents are welcomed and appreciated. Click here to download the Kids Brochure. Click here for Parkfield Bluegrass Kids & Teens (Song Sheets). Click here to download the information and registration form for the Kids Music Camp for Kids and Teens. Programs are also listed below. 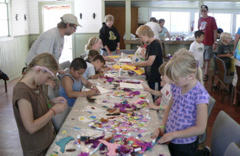 All kids’ programs are located in the Parkfield Community Center. Bring the little ones and the bigger ones to a musical workshop just for them! All are welcome. Bluegrass band “Blue Summit” will demonstrate bluegrass instruments, singing, dancing and how to play and sing together the bluegrass way. Kids and teens are welcome to join into the workshop, so bring your instruments and talents to have a fun time. 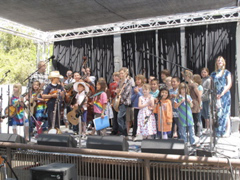 With parents’ or guardians’ permission, kids can participate in Bluegrass Kids’ Camp, hosted by Gerry Higbie and Bluegrass band “Blue Summit”. Camp meets for one hour at a time and culminates Sunday at 11:30 a.m. with a kids’ stage performance. Kids are asked to attend each of the Camp sessions. 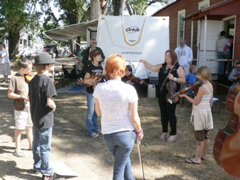 Kids can bring an acoustic instrument (guitar, ukulele, banjo, fiddle, bass, mandolin) and learn to play the tunes as of yet to be determined. Classes are geared to the beginner, and advancing players are welcome. Kids can also play a practiced, individual tune of choice on stage. Bring one old time, old time country/gospel, folk or bluegrass number. For many years Chris Giuffre and her loyal assistants from Lompoc have presented a kids’ craft project at noon on Saturday. The kiddos will make a lovely gift for Mom. Its a good idea to wear old clothes in case of spills. Charlie and Ann Bockius return for this popular program Saturday evening at 7 p.m. Bring the youngsters in their p.j.s. Younger kids will enjoy singing along as they wind down for bed, and older kids help out. If you are bringing children that will participate in the Parkfield Bluegrass Kids’ & Teens Music Camp, please submit the on-line Registration Form. This will help our teachers prepare supplies for the kids.